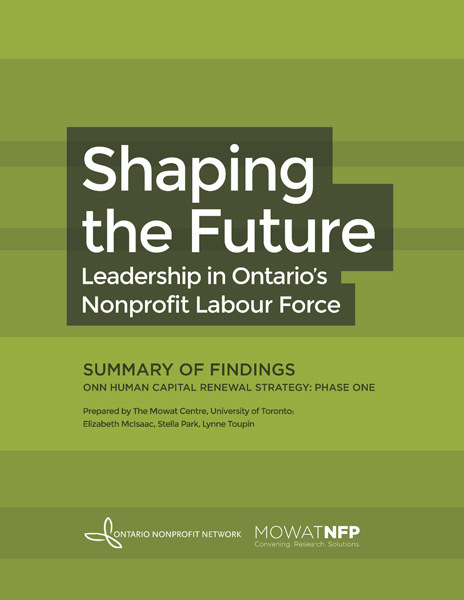 This paper draws on an Ontario-wide survey of not-for-profit sector leaders to examine the challenges and opportunities of human capital renewal in the sector. Why Data, Why Now, What Next? With the first phase of ONN’s “Human Capital Renewal Strategy” complete, this summary report highlights key findings from new survey research. It lays the groundwork for strengthening and expanding made-in-Ontario strategies to renew our people – the foundation of passion, creativity and skills that sustain our sector’s dynamic and effective contributions to community well-being. ONN began this initiative after hearing from many nonprofits that their capacity to deliver on their public benefit mandates could be more effectively sustained if we had sector-level supports for organizations to creatively and effectively respond to pressing demands. The nonprofit labour market is a major force for Ontario’s social and economic development. Yet sector specific research and comprehensive databases are largely unavailable, posing a barrier to meaningful human resource planning and development for our sector. Mowat NFP, our research partner for this first phase of work, and author of this report, has done an extraordinary job in gathering and analysing new data that will help to clarify and focus our efforts. While more extensive research is needed on the labour-market challenges and conditions in our sector, we have helpful information to inform immediate actions. In the next phase of this work, ONN will continue to broaden our engagement with sector leaders and stakeholders to generate pilots for new human capital renewal initiatives, and to highlight and propagate existing initiatives that are having a positive impact. This will include our province’s local training boards, social planning councils, regional nonprofit networks, university and college programs, sector unions, and our many sub-sector associations providing skills training, leadership development, and HR capacity building. Thank you to Mowat NFP and our passionate volunteers on the Partners’ Advisory Council who helped guide and sustain these efforts, and the Ministry of Training Colleges and Universities (MTCU) for providing financial assistance to support this research. We invite you to be part of shaping and implementing our sector’s next steps on this dynamic and critical journey.